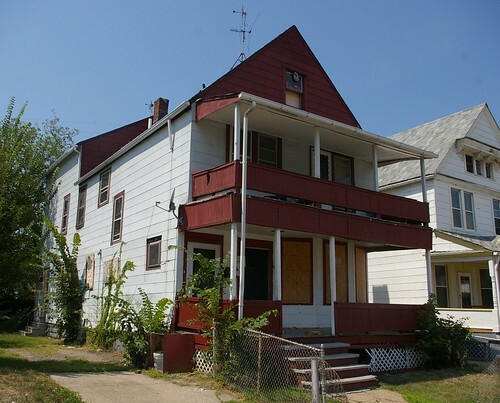 As I reported last week, the two surving houses where poet and author Langston Hughes lived in Cleveland (of an original five) have been condemned. Yesterday, in the Plain Dealer, Sandra Livingston reported on the state of the situation regarding these important pieces of Cleveland history. She noted that the houses had been condemened in June, even though a Cleveland Landmark applicaion was pending for one of them - 2266 East 86th Street. Ms. Livingston noted that officials from Fairfax Renaissance had not returned her calls - as of right now, they have not returned mine, either. It's worth noting that the individual responsible for the project is no longer working for Fairfax Renaissance. Ronald J. H. O'Leary, Assistant Director for Building and Housing is quoed as saying that "They [Fairfax Renaissance] will be submitting the permit application soon to correct the condemnation notice." Today, an editorial in the Plain Dealer criticizes Fairfax Renaissance for their inaction, stating "This is no way to deal with a stricken piece of history. The nonprofit community group needs to renovate the home, as promised, or turn it over to someone who actually will." I will continue to attempt to contact Fairfax Renaissance about the preservation of this vital piece of our history. I will also make sure that the appropriate paperwork has been filed with the city housing department. As for 2256 East 86th Street, where Hughes lived with his mother in a five room apartment from early May, 1936 through April 21, 1937, I'm working to learn more about the present condition of the structure. I hope to have copies of photographs of the interior by early next week. These two homes represent a crucial piece of the history of Cleveland. We must remain vigilant. Historical markers might help keep them from being accidentially bulldozed. Vinyl text on aluminum might do the job. Does anyone out there have the means to fabricate them? I just spoke with Vickie Johnson, executive director of Fairfax Renaissance Development Corporation. She said that their plans for this house remained the same, and that they remained committed to rehabbing it. She indicated that her staff had filed the condemnation appeal with the Board of Building Standards. She further promised to keep me updated as to the status of the project. I believe her. This house did not seem like many of the other houses that have been condemned in this neighborhood - it is in much better condition. It seems to me that there's more an issue of the wrong houses being condemned, which merits further investigation. Don't believe Vickie Johnson for a minute...oh, and guess what? Community Development Director Daryl Rush's wife works for Housing Court...ain't that sweet...? Just a note to say that my godfather, the late Professor Andrew Bongiorno of Oberlin College, was a classmate of Langston Hughes and remembered a Polish family who sort of adopted Andrew and Mr. Hughes, encouraging them in their studies and their reading. Andrew, the son of a Sicilian plasterer, became a very distinguished Dante scholar and a much beloved teacher at Oberlin College.